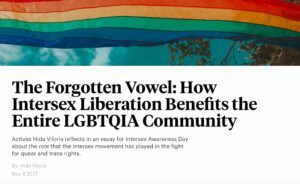 Really love this one, my latest essay, “The Forgotten Vowel,” about how acknowledging and including intersex people and LGBTQIA+ coalition benefits us all. :) Enjoy, and big thanks to INTO magazine–the only LGBTQ website to receive the honor of being shortlisted (this past October) for the Shorty Award in news and media–for running it! It came out yesterday for Intersex Solidarity Day, November 8, but I was so busy wearing my activist hat I didn’t realize, lol!